We all have them, those memories from school of the best day of the week. No, not sports day. CRAFT DAY! This list of craft fun is endless; making snowmen with cotton wool balls, fish with paper plates and – my favourite – paper marbling. I can’t remember the exact technique that was used at my primary school but all I know is things got messy… fast! 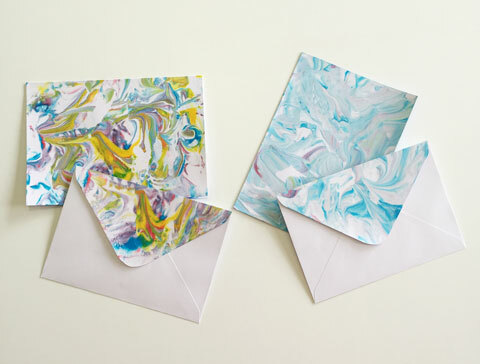 This month for the Made It Pinterest Challenge we are asking you to tackle the world of paper marbling. 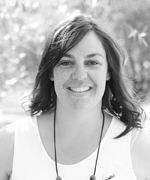 Head over to our Pinterest page and check out the board we have for you to get started. There’s techniques on how to do it and also some great ideas on how to use your gorgeous paper when you have it made. As always, we’d love to see your beautiful creations, and even your not-so-beautiful attempts! 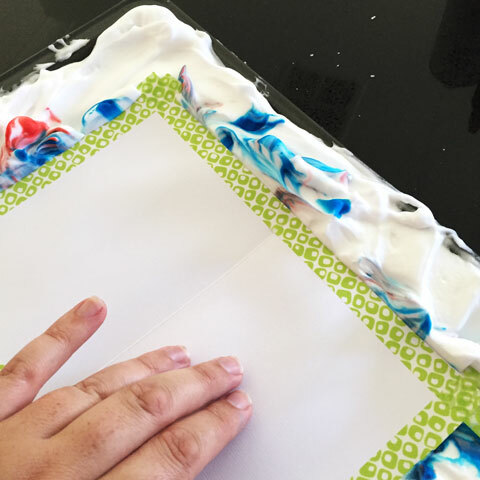 Start this project by taping off the back of your paper – this is to stop messy overflows and fingerprints when picking up. I used a heavier paper 280gsm with a slight canvas texture on it. Now it’s time to get messy! Cover the tray with a generous layer of foam, around ¾ inch thick. Your tray needs to be large enough to fit the size of paper you have for the project. Pop a few drops of colour into the foam. 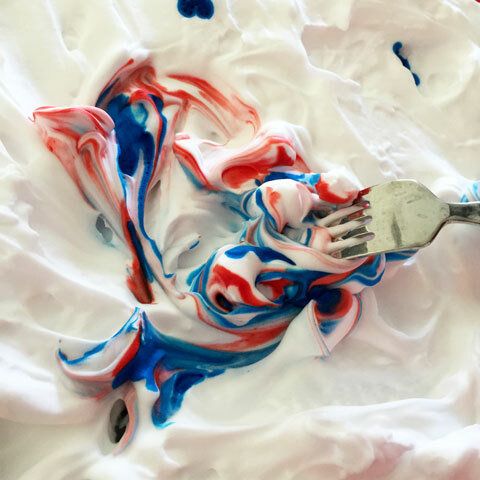 With a fork, gently mix and fold the colour into the foam. Be careful not to over-mix it here, as you really want to keep the colours in a swirling pattern. Get your paper and place it into the foam tape-side up, and press down *gently* to ensure as much of the paper as possible comes in contact with the shaving cream. At this point, don’t let the paper sit too long as it will get too wet. Pick up the paper from one corner and place on some paper towel (shaving cream side up). 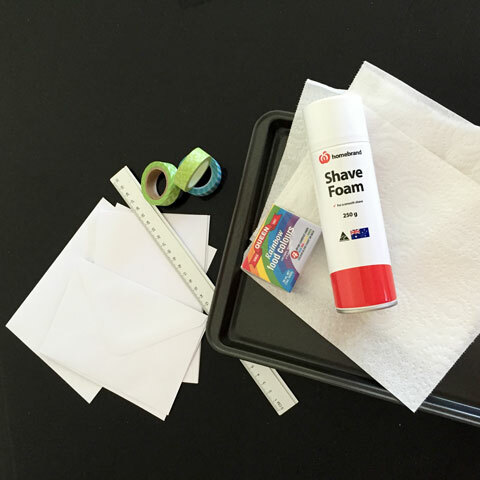 Now get your ruler and from one edge scrape the shaving cream off in one sweeping motion. And there you have it – your gorgeous creation has just been revealed. Take a clean piece of paper towel and wipe any excess shaving cream and set aside to dry. All you have to do now is pick your next piece of paper and go again, and again, and again! This project was so much fun! I found it really hard to stop! 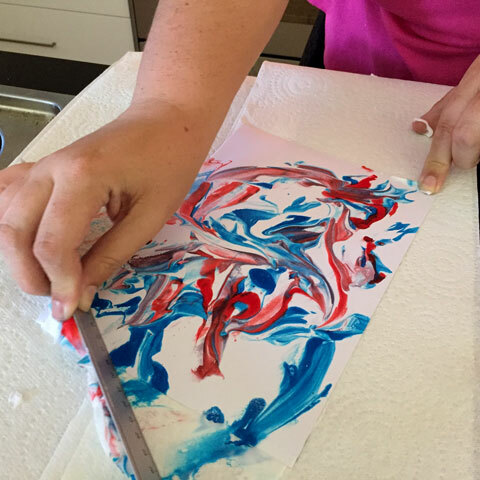 If the colours get too muddled just start with a fresh lot of shaving foam, or if the marbling is becoming too light, grab some more colours and brighten things up! Once all the paper has dried 100% (note: do not leave them outside to dry in the sun with a slight breeze… unless you want to chase them around the backyard,) pop your works of art under a few heavy books to flatten out. 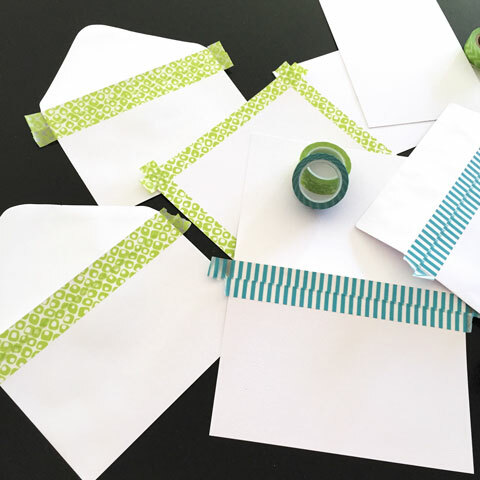 Carefully peel the washi tape off, and you are done! If you’re not using thicker stock card and you are worried the washi tape might tear your paper, try using the delicate painters tape. Now the question is – what do we use the cards for? If you've had a go at this month's Pinterest DIY, we'd love to see it. Share your creations on Instagram and tag us @madeit (or share & tag us @madeit.com.au on Facebook) before the end of April to be in the running to win a $50 voucher for the Made It store of your choice! wow! this looks great and so much easier than other methods I have tried. Will have a go and share with you this week.